I received an e-mail and was asked to review the new series of trading cards from Bella Sara. I wasn't sure if Zoe was old enough or not... but I was interested in finding out about the kinds of trading cards that are available for girls because Zoe is definitely interested in "collections". We were mailed 1 pack of cards and opened them as soon as they arrived in the mail. I have to say Zoe wasn't all that interested in the cards. She took a few minutes to oohhh and aahhh over them the first day and then never looked at them again. My 8 year old niece, Larisa, on the other hand... she was excited the moment she saw them. She told me she already had some... and was REALLY hoping that when I was done she could have mine too. So maybe 5 is too young? The card pack I received contained "5 random horse, story, and/or character cards, 1 random sticker card, and 1 secret code for play at BellaSara.com". The cards are nice quality "playing card" type cards. They have pretty fantasy art on the cards depicting different characters in the stories and games. Some of the cards have quotes or sayings on them like "Think positive every day! Feel the bliss of joy and energy that comes with it." Very "girly". Once I opened the cards and took out the "secret code" I logged in to the web site. It was nice to find out that even if I didn't have a code I could have played the games on the site. Before even entering a code (which you need to purchase something to get) I was able to create my "avatar" (pick a hairstyle, dress her, eye color, etc.) and adopt a pony to take care of (feed, clean, pet). I was also able to enter the Bella Sara Adventures world and had 18 free adventures to complete (things like plant flowers, save a creature from a wolf, deliver a message to Bella). Once I entered my code I recieved 4 additional adventures and 2 horses for my stable (which you also can visit and care for like your pony). There was A LOT to do. Again... 5 year old Zoe seemed a little young because there is a lot of reading. 8 year old Larisa REALLY loved taking care of her pony... and she was able to read the directions for the adventures. She still wanted me to sit and help her though because at times there was a lot of reading. Once the girls were done I sat down by myself to play a little... and I can say I enjoyed it all... and found some of it a little challenging (especially remembering where I needed to go in Bella's world to find what I was supposed to find). Thank goodness there is a journal that you can check in to remind yourself of what you're supposed to be doing! - From what I can tell the Bella Sara products are all reasonably priced. A little girl could probably easily save up her own money to get the trading cards or story books. - The cards and games seem to inspire creativity and fantasy play. - The messages given by the cards and game seem to be positive and uplifting. - If you like collecting things... these cards are easily collectible. - There is a lot to do online. And... if you like ponies it's Heaven! - Everything is just so PRETTY and GIRLY! - Some of the online games required a lot of reading. Only negative for younger children. Would be no issue for say... 2nd graders. Or kids who have parents with time to sit down and play. - I'm not sure how much of the gaming site is useful once you've used up your free adventures. Purchases would be required to get secret codes and continue on with adventures.... I think. - Depending on how you feel about it... Everything is just so PRETTY and GIRLY! Overall... if this has anything to say about our thoughts... I added BellaSara.com to our bookmarks. We'll be playing again! Like I said above... Bella Sara products are available at Target, Wal-Mart, Toys R Us, several independent retailers and at BellaSara.com. 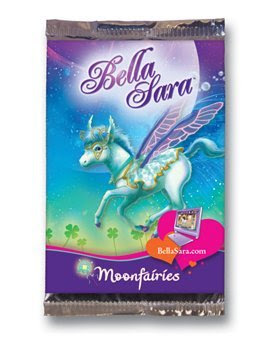 The Moonfairies card packs retail for about $2.99 a pack.. but 1 reader can win a pack right here! Comments saying something like "pick me" will not be considered entries. Giveaway will be open until midnight on Saturday, July 24, 2010. I will choose the winning comment with Random.org.